Shimla: To control the drug menace in the State, Cabinet directed to launch a special campaign by involving Education, Health, Police, Social Justice and Empowerment departments besides ensuring active participation of panchayats, mahila mandals, parents, school children and teachers etc. It also directed to promote alternative crops in the traditional cannabis growing areas so that people could be motivated to grow alternative crops. The cabinet mulling to make amendments in the Narcotic Drugs and Psychotropic Substances Act to make it more stringent to curb this menace. It was stressed that a State level Special Task Force be formed to nab the drug peddlers throughout the State. The Cabinet also directed the Home Department to hold regular coordination meetings at the Director General level with the neighbouring States. It directed to conduct joint police operations with neighbouring States to check inter-State drug flow. The Cabinet was apprised that during the last six months poppy was destroyed from 1366 bighas as compared to only six bighas in 2017. Apart from this, 831 drug offenders were arrested and cases were registered against them during the period. The Cabinet approved the procedure for implementation of GST for the running work contracts prior to 1 July, 2017. It also decided to introduce incentive clause in standard bidding document for the works having value of more than Rs. 50 lakh for their early completion and to boost the morale of contractors. It decided to allow contractors for installation of crushers at their sites to convert the muck into useful material so that the same could be reused in construction works. It also gave approval to allow contractors to procure various materials such as tor steel, bitumen, CGI/PGI sheets from open market at their own. Cement will be procured by the contractors from Civil Supplies Corporation against permits issued by the concerned Executive Engineer at their own. By allowing the contractors to procure material at their own level, they will not face shortage of supply in PWD stores which would ensure time bound completion of various works. 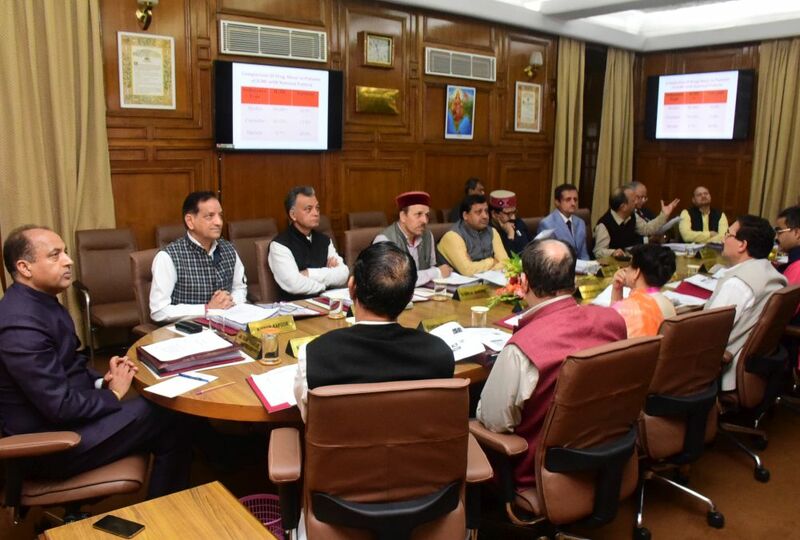 The Cabinet gave its nod to provide adequate manpower for effective implementation of JICA assisted Himachal Pradesh Forest Ecosystems Management and Livelihoods Improvement Project to be implemented in six districts of the State viz. Bilaspur, Shimla, Mandi, Kullu, Kinnaur and Lahaul –Spiti. This project will help in sustainable forest ecosystem management, sustainable biodiversity management and livelihoods improvement support in these districts. It also gave its approval for policy guidelines for extraction and utilization of un-economical salvage timber lots not acceptable to Himachal Pradesh State Forest Development Corporation Ltd. Due to un-utilization of salvage trees, the State exchequer was suffering huge revenue losses and in order to utilize the un-economical salvage timber lots these policy guidelines have been approved by the Cabinet, which will not only prevent illegal removal of the trees but also provide timber and fuel wood required by various departments for execution of different developmental activities. As per the guidelines only salvage trees are allowed under TD rights for use in construction of new residential house or cowshed and for their maintenance. 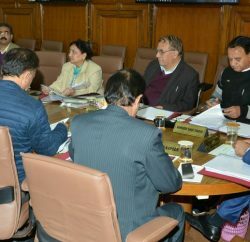 The Cabinet gave its approval for policy for collection and removal of chil pine needles from forest land so that these may be used and utilized for setting up of small scale industries based on chil pine needles. This will reduce forest fire hazards and encourage industries to use chil pine needles as fuel. The State Government will provide investment subsidy of 50 percent of the capital cost for establishing such industries. In order to redress the long pending demand of Bhakra Dam oustees, the cabinet decided to give maximum relief to the oustees and their families and approved necessary amendments in the policy. The Cabinet decided to convene monsoon session of H.P. Vidhan Sabha from 23rd August to 31st August, 2018 at Shimla. It will have seven sittings. The Cabinet gave its approval to produce vaccination certificate during the admission in first standard in all government/ private schools. This will ensure that all the children in the age group of five years have completed vaccination programme. Cabinet decided that Kargil Day will be celebrated all over the State in DC,s, SDM and BDO offices. The officers should hold meetings in which Ex-Serviceman should be especially invited, visits should be made to War memorial and Shaheed Samaraks and oath should be administered. 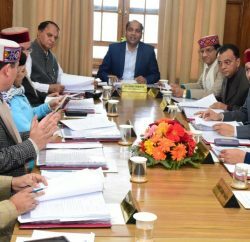 The Cabinet in its meeting held here today under the Chairmanship of Chief Minister Jai Ram Thakur decided to allot Dugar Hydro Electric Project with capacity of 449 MW in favour of NHPC limited on BOOT basis for a period of 70 years after completion of which the project will revert to Government of Himachal Pradesh with specified generation capacity, free of cost and free from all encumbrances.